Review and understand the schedule. YOU MUST ATTEND THE MANDITORY ATHELTE MEETING on Saturday, April 6th at 5:00 PM. CLICK HERE TO VIEW THE SCHEDULE. Note that the schedule is subject to change due to current weather or snow conditions. 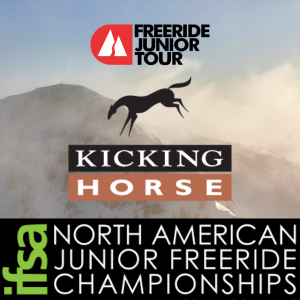 New for the 2018-2019 season, all U12 Freeriders, including Canadian riders, will receive an invitation to U12 Champs. A limited number of competitors will be admitted and registration will be conducted on a first come, first served basis. Note that we are no longer providing an IFSA Overall Ranking for U12 riders, see Section 1.8 of the IFSA Junior Handbook. At U12 Champs, the U12 North American Freeride Championship event winners will be announced following the competition at a podium ceremony. There will be NO IFSA Overall U12 Champions. Space is limited and U12 athletes are NOT guaranteed a slot until they register for U12 Champs. Registration will be first come, first served. U12 athletes must have competed in one or more IFSA-sanctioned Freeride events in order to register. No first-time athletes will be permitted. Athletes age 8 and above are welcome to register. As a courtesy reminder, we do not advise booking travel before your invitation has been confirmed. Event Registration: REGISTRATION BY INVITE ONLY - All U12 Division Athletes age 8 and above who have competed in one or more IFSA-Sanctioned Freeride event in 2019 may register. Registration instructions by email will be sent directly to all U12 American athletes on March 11, 2019.